Rabbi Meir Kluwgant initially said he did not recall sending the text message to the newspaper editor (photo: Royal Commission into Institutional Responses to Child Abuse). Australia's most senior rabbi sent a text message calling a father whose children were molested at Melbourne's Yeshivah College a "lunatic" who neglected his children, the royal commission into child sexual abuse has heard. Rabbi Meir Kluwgant admitted sending the message about Zephaniah Waks to the editor of the Australian Jewish News, Zeddy Lawrence, on February 3. The Waks's lawyer Melinda Richards SC put it to the rabbi that he sent an SMS to Mr Lawrence which read: "Zephaniah is killing us, Zephaniah is attacking Chabad, he is a lunatic on the fringe, guilty of neglect of his own children, where was he when all this was happening?". "I may have sent that, yes," Rabbi Kluwgant replied. The rabbi is the president of the Organisation of Rabbis of Australasia. He initially said he did not recall sending the text message and denied watching or listening to Mr Waks's testimony. "I actually was in surgery at that time, so I was under general anaesthetic, so that day I wasn't really following proceedings," he said. The rabbi then conceded he might have seen parts of the testimony. Two of Mr Waks's sons were molested by convicted child abuser David Kramer, and another son Manny by serial child abuser David Cyprys. 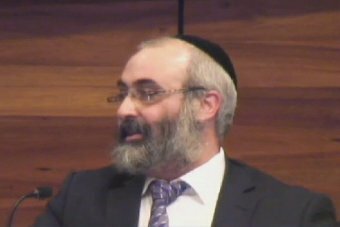 Mr Waks told the commission he renounced the ultra-orthodox Chabad movement after his family was persecuted for going public about the abuse. Manny Waks posted a message on social media in which he called for Rabbi Kluwgant to resign or be sacked immediately "from every leadership position he currently holds". "We have just heard the most senior rabbi of Australasia, Rabbi Meir Shlomo Kluwgant ... publicly admit to sending a shocking, vile message to the editor of the Australian Jewish News, viciously attacking my father (during his testimony at the RC, no less) and blaming him for the sexual abuse of his three children (myself included)," he wrote. "Rabbi Kluwgant has been one of the leading forces behind the horrific intimidation campaign against me and my family. "Until today it was difficult to prove. It has finally been exposed publicly." Rabbi Kluwgant earlier agreed with Ms Richards that too many people had indulged in personal attacks, rather than examining Yeshivah's response to allegations of sexual abuse. He also agreed it was "wrong and in fact destructive to ever seek to shift responsibility from the abuser and the institution within which a child is abused, to a parent who has entrusted a child to that institution". The response to abuse allegations by some sectors of the orthodox community prompted several rabbis in Sydney to publicly pledge their support for child abuse victims. "We cannot imagine your pain, we apologise for not doing enough and not understanding you - you do have someone to turn to," Rabbi Aron Moss said in video posted to YouTube. "We will listen to you, we will believe you, we will support you," Rabbi Michoel Gouriarie said. "You are not alone. You are not to blame." The rabbis in the video, which went for almost two minutes, called on the perpetrators to take responsibility for their deeds. "Your actions are inexcusable. Take responsibility for your deeds. We will not shield you from the consequences of what you have done," Rabbi Moss said.